06 Oct Winner winner, chicken dinner. Please excuse us for not wiping the smiles off our faces, because we’re pretty freaking happy. 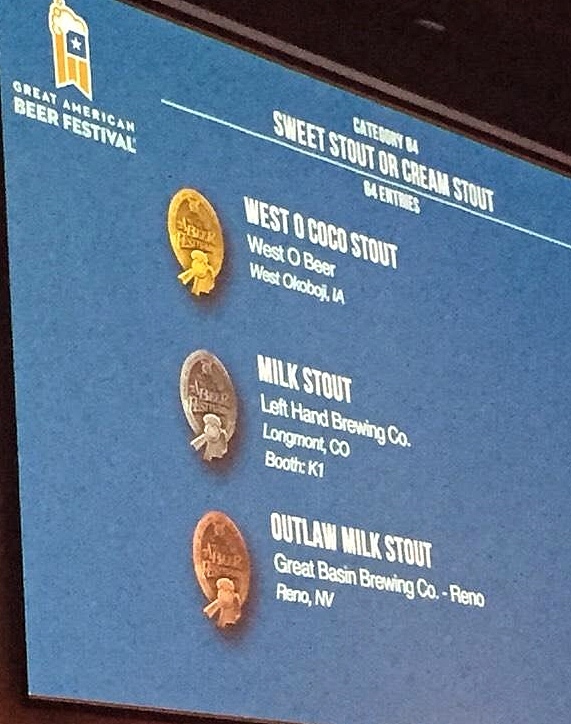 On Saturday we received notice (and by notice, we mean about a zillion Twitter messages in a 15 minute time span) that West O CocO Stout had won the Gold Medal in the Great American Beer Festival® 2014 Sweet or Cream Stout Category. Beating 63 other entries. Of course, “we” is a stretch, because this totally is head brewer Karl Schmitz’ baby. He started with an idea, and finessed it into something amazing (guessing we’ll have to buy him a scooter or snowplow or something.) Also shout outs to Left Hand Milk Stout (silver) and Great Basin’s Outlaw Milk Stout (bronze.) Special kudos to Lion Bridge Brewing Company, the other Iowa brewery to come away with the Gold for their Workman’s Compensation mild ale. Iowa craft beer FTW! West O CocO is available on tap, and will soon be available in bottles. Watch for it.